I started the piece after the new year. He stands at about 12' - a lot bigger than my usual 8' . Its my first time using Chavant clay. So far I like it very much. Still is in a very rough stage. I also have a sculpey sculpt tutorial I am trying to get together for some of you guys who have sent emails. 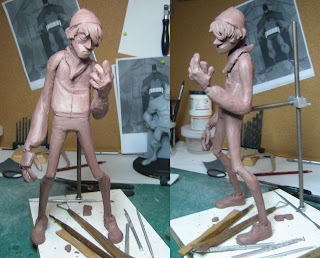 My biggest hold up right now is designing the character to sculpt. Takes me for EVER!! Very cool, Irene. Love your work! AWESOME Irene! I love this guy. I am a hipster in training, haha. Many are my friends are practicing hipsters, Brooklyn, iPhones and all, lol. And I, too, love 'em. I think their style yields the best silhouettes! I can't wait to see this finished. I would definitely buy one if you had this 2 Comic-Con or sumthin'! Looking at this just makes me aware that I'm turning into a hipster. Sweet :-D Rocking that sculpt Granddad! More people who stare at hipsters!!! Don't worry we've been planning your intervention since comic con. It's great, again! Damn you're good at this..
looking great, irene! and can't wait for the tutorial! cant wait for the tutorial!! LOL, you forgot some essential hipster gear. A Chrome Bag for his Fixie bike, a rock climbing key chain in his back pocket, and Obama Hope buttons..... Jk! it's looking great! cant wait to see this done. What do you use for your armature? I'm in the process of designing my first sculpt and am brand new at this. I want to use super sculpey for my first piece. Later on when I've gotten my sculpting chops I'll try maybe wax or better clay. My email is hamiltoons1@aol.com. Love your work Irene! Es broma=) De verdad aluciné con tu curro. Fuera coñas, sería un pedazo de honor. PD: Continua con esos trabjos cojonudos. PD2: Es muy difícil vender esculturas? Ni idea sobre ese mundillo, aunque me encanta, aparte de coleccionar algunas, he tonteado con hacer abortos. A veces las uso para entender el volumen de los diseños. I really dig the style on this one. Ryan told me about your work a while back, but I hadn't seen much outside of the Kuta sculpt until now. Awesome work. Nice work. I'm looking forward to your tutorial.